Order Wholesale Chocolate Candy Boxes for those occasions when you want to really treat your family, friends, or employees to an extra special treat. Bulk boxed chocolate can be purchased at discount prices that can really save you money. If you would like to get a wholesale box of chocolates, (or two or ten), there are several suppliers that you can browse to find just what you are looking for. Some of these companies are more pricey than the others. Depending on your situation, you may want to have a good look through the list. Corporate shoppers wouldn't think twice about spending $30 - $50 or more per box for promotional gifts and incentives. However, you may be like me and can't splurge quite that much for a large group. In that case, let me recommend that you prepare your own gifts even if you don't make the chocolates yourself. 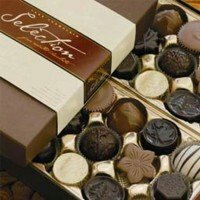 You can actually order from Dan's Chocolates, for instance, bulk truffles, or bulk chocolate covered cherries, or bulk chocolate covered raisins, etc. Why not consider ordering the chocolates in bulk and then repackaging them yourself into gift boxes, tins, or bags? That may be far beneath some of you, but for the majority of us, it works great. You can get some wonderful boxes and packaging items at Candyland Crafts. You won't believe how reasonable the prices are. Whatever you decide, I can't imagine anyone being disappointed in receiving a lovely chocolate candy gift! By the way, at Dan's Chocolates, you can also get a good price on wholesale boxes of chocolates customized with your business logo, or a personal photo, etc. I'm fairly confident that they can provide you with exactly what you are looking for.